Rockford has plenty of skeletons in its communal closet; there are many stories that some people wish would never come to light. But this story is about the actual skeletons that have popped up in our city from time to time. Some of the oldest skeletons come from the hundreds of mounds that were built along the Rock River over one-thousand-years ago. There have been some skeletons found where one would not expect to find them. One such story took place in September of 1874. It was the location of one of the first hotels in the downtown area. The hotel itself burned down around 1864 but the foundation still remained. On this particular day, Henry Williams was digging by the bank of the river. He scraped away the layers of rotten straw until he reached the boards that once made up the floor of the building. Henry was pleased to see that the wood for the floors was in pretty good shape. He began to pry up the boards and throw them into his cart. Henry had been working for a time when he uncovered something unexpected. He was digging under the boards to see what else he might salvage when he discovered some bones. At first, he believed that they might be some animal bones but, as he dug deeper, he realized that the bones were human. The authorities were called and the bones were properly extracted. The ground was inspected carefully to ensure that no other bodies remained. The bones were examined by local doctors. Due to the small size of the skeleton, it was suggested it might have come from a woman or an older child. The pelvic area was too damaged to give a definite answer and the top portion of the skull was missing. The teeth that remained were in good condition and the doctors thought that the person could not be more than 20-years of age. Though there was a cemetery located nearby (across from the Tinker Swiss Cottage), it did not extend this far down toward the river. But some older settlers remembered an incident that might account for the body. In the 1840s, a family was passing through Rockford with all their worldly goods and a flock of sheep. They attempted to cross the river where the ford was once located and some of the sheep got into a dangerous area. The son quickly moved to drive them back and got into the deeper area himself. His father, sensing the danger rushed to help. They both were drowned that day and buried together. 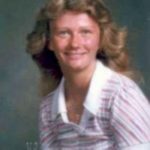 This could account for the skeleton and an extensive search was made in case there was a second body buried in the same location, but no other body was found. This led to speculation that this person might have been the victim of foul play. Another partial skeleton was discovered in a keg by the depot on South Main Street in August of 1887. Its discovery was made while police were investigating a strange report. A person who was in one of the taller buildings on State Street had seen a group of young men sawing a body into pieces. The barrel was opened and the contents were sent to the coroner for further inspection. A newspaper reporter decided to check out the story and snuck into a building owned by the Hanford Oil Company. On a shelf, he noticed a box marked “soda”. He opened the box and found the rest of the skeleton, including the skull which was cut into two pieces. In fact, all of the bones had been sawed apart. Further questioning was done by the police and it was discovered that a number of young men had formed the Rockford Anatomical Society. It seems that the manager of the Hanford Oil building, Charlie Porter, was also the head of this particular club. Charlie was chastised by the police and told to “take better care of your dead.” There was no word about where the young men had acquired the dead body. And our final story takes place in 1914 at the intersection of Shaw and McCaughey Streets (now Second Avenue) on the near-east side. While construction men were excavating the area to prepare it for a new sidewalk, they discovered some small bones, wood and metal pieces. These would later prove to be a part of a casket. This particular find caused a sensation but not as much as the previous two stories because it was known that an old burial ground was located in that area. The bodies had been reportedly moved over 63 years before. The original private cemetery was located on the land owned by Bela Shaw, one of Rockford’s early settlers. 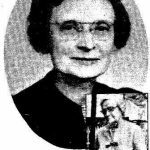 Judge Bela Shaw was one of the founders of the Cedar Bluff Cemetery Association and the owner of the twelve acres that was purchased for the cemetery in 1851. 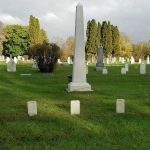 He and the other men of the association contracted David D. Alling to remove the bodies from the private cemetery and to place them into Cedar Bluff Cemetery. The records for the private cemetery were incomplete however and unfortunately, some of the bodies were not located for removal. It was theorized that the pieces of bone and wood were from one of the bodies that had remained.